The volume and velocity of content continues to rise exponentially, yet companies are still limited by finite time in the 24-hour day. Yet, savvy organizations are discovering creative ways to harness this surging tide of content, ensuring that users can work both faster and smarter. 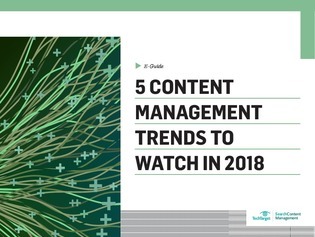 In this e-guide, content management expert Geoffrey Bock, dives into what's going on with content management this year – think smart content getting smarter, omnichannel delivery advancements, digital asset management and more.